Ride the wave with WHISPERWAVE. 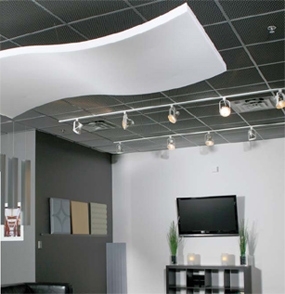 WHISPERWAVE curved accent products allows you to unleash your creativity while reducing noise and reverberation. 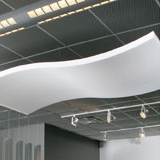 Add dimension and acoustical control right where you need it the most with WHISPERWAVE ceiling clouds. Ceiling clouds are suspended on ceiling-mounted cables using corkscrew hangers. Made from Class 1 fire-rated melamine foam, WHISPERWAVE products are offered in standard and custom sizes and curve patterns. WHISPERWAVE products are lightweight and easy to install. The line also includes acoustic baffles, panels and awnings. WHISPERWAVE products are available in natural white and light grey or can be Hypalon®-coated (black, grey, white, almond or charcoal) or painted (charcoal, beige, brown or blue). Custom colors are also available to match school colors or any décor. WHISPERWAVE Panels, Acoustic Baffles, Ceiling Clouds and Awnings provide exceptional acoustical control and design flexibility. Lightweight and easy to install, WHISPERWAVE products are ideal for use in classrooms, cafeterias, multipurpose rooms, indoor swimming pools, offices, libraries, religious facilities and other large open areas. 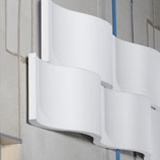 WHISPERWAVE ceiling clouds, acoustic baffles, panels, and more are made from melamine foam, which is Class 1 fire-rated for flame spread and smoke density. Melamine natural also meets the corner burn test UL 1715. 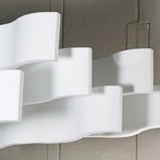 WHISPERWAVE is offered in natural white and grey and can be painted or Hypalon®-coated. Toxicity Passes University of Pittsburg Toxicity of Smoke Emission test.